Sometimes we need a usb cable to connect two devices. Sometimes an HDMI cable a DVI cable is used for video. Getting the correct cable can be surprisingly difficult, because there are many types of connections for each of those cables. The secret is to determine what kind of cable you need before you buy it. Check your device connections carefully to determine precisely which cable you need. Here is a pictorial guide. 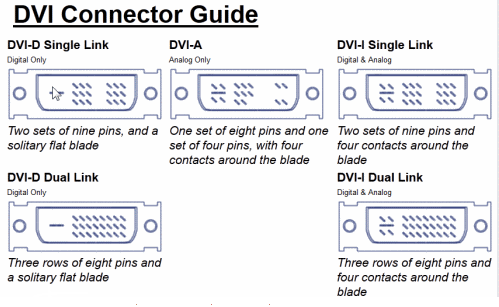 There are 4 major USB connectors. Type A is what we are used to on most computers. Type B is most common on printers. The Mini-A connector is, I think the most common on tablets and phones, but sometimes you run into a Mni-B connector (I have one on my GPS). I have a USB Hub at my office with both mini types of cable connectors attached, so I can plug in normal USB thumb drives directly, or either type of Mini. Single link cables are limited to a maximum of 1920x1200 pixels, so they may not work with some very high pixel count large monitors. 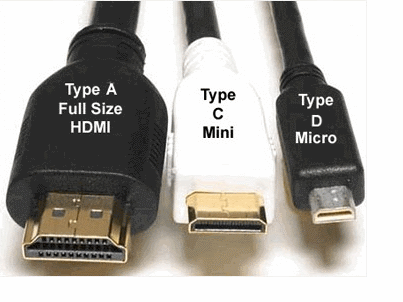 A tablet or notebook could be using either the Full size A or the Mini type C connector or the Micro Type D connector. 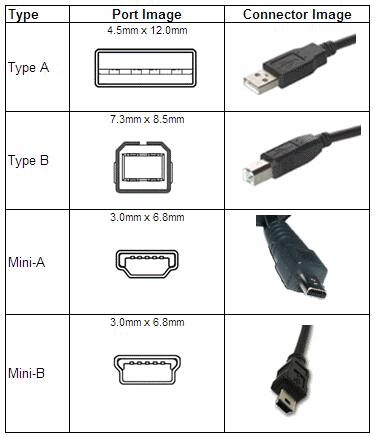 Hopefully these pictures will help you be sure and order or buy the correct cable for your device.